Last Friday, the Sharon High School Eagles suffered their worst loss of the season against the Milford High School Scarlet Hawks on the road, losing 42-7 and now have a record of 1-4. The Eagles play another road game against the Canton High School Bulldogs at 7:00 p.m. Friday. Milford struck first with a 1 yard run, but Sharon answered back with a 36 yard pass from senior quarterback Jeremy Ruskin to senior co-captain wide receiver Chris Gong; followed by a successful extra point by senior kicker Mitchell Director. The Scarlet Hawks then scored 35 unanswered points on a 12 yard pass, a 51 yard pass, a 25 yard pass, a 37 yard pass, and a 7 yard run. Milford also connected on all six extra points. The offensive standouts included Ruskin, throwing for 97 yards with a touchdown, and Gong, who caught 2 receptions for 41 yards and a touchdown. The defensive standouts included sophomore linebacker Nicholas Marrero, who had 9 tackles including 1 for loss and 2 assists, and senior cornerback Brandon Buckman, who had 6 tackles and an interception. Junior defensive lineman Rhamsez Thevenin and junior cornerback Gabe Merck logged their first stats of the season. Thevenin made an impact having 5 tackles and Merck had 1 tackle. “It felt really great, you know, cause I have not been on the field that much. When Coach [Morse] put me in, it felt kind of special,” Thevenin said. The undefeated Bulldogs have the most wins in the Hockomock League and are ranked fourth in the Hock, after wins against the Dighton-Rehoboth Regional High School Falcons, the Bellingham High School Blackhawks, the Milford High School Scarlet Hawks, the Foxboro High School Warriors, and the Stoughton High School Black Knights. Canton is 1-0 at home after their win last week against the Black Knights. Sharon is 1-2 on the road, and secured their only win of the season in week 1 against the Nauset Regional High School Warriors. Their two away losses were against Milford last week and the Ashland High School Clockers in week 2. Last season, Sharon had a three year win streak against Canton, broken when the Bulldogs destroyed the Eagles winning 31-2. Canton has the edge in the series going into this game as Sharon has a 6-7-1 record against them since 2004. 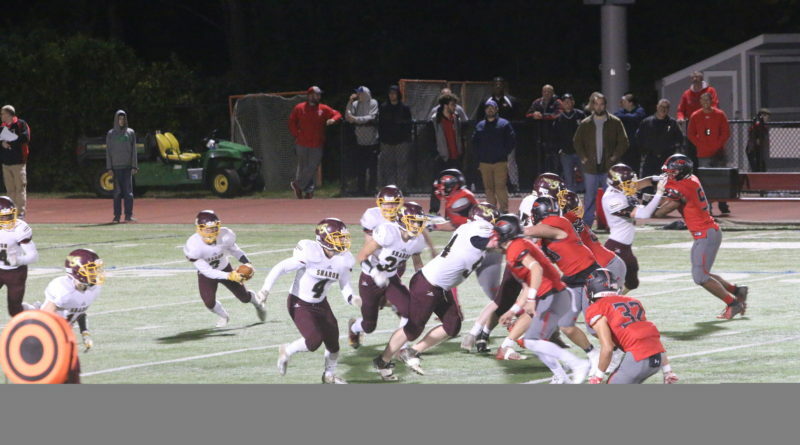 The Eagles will have to play their best football in order win their first game against a Hockomock League team and beat one of their main Davenport Division rivals. The last time Canton beat Sharon in consecutive years was from 2006-2009. “I think we have to stay true to our game,” senior co-captain Aaron Strong said. “They are definitely going to be a tough opponent, but if we stay disciplined and play our best game we can win,” he added.